Davis Bunn is a four-time Christy Award-winning, best-selling author now serving as writer-in-residence at Regent's Park College, Oxford University in the United Kingdom. Defined by readers and reviewers as a “wise teacher,” “gentleman adventurer,” “consummate writer,” and “Renaissance man,” his work in business took him to over 40 countries around the world, and his books have sold more than seven million copies in sixteen languages. Unlimited is Davis’s first screenplay to be released as a major motion picture. The book, Unlimited, is a novelization of the screenplay. The inspiration behind the Unlimited film and novel is Harold Finch's book, Success: Four Keys to Unlock Your Unlimited Potential. Download a free copy of Success here: http://unlimitedthemovie.com/4-keys-book/. The storyline in Unlimited is inspired by true events. What actual events inspired the story? Harold Finch was formerly the founder and CEO of the first management-leadership consulting groups in the US. In the mid-seventies he sold the company to H&R Block for over a hundred million dollars—back when a hundred million actually meant something. Answering God’s call, he has spent the past three decades traveling the world, teaching his concepts for free and helping underprivileged children learn that they do indeed have both a purpose in God’s eyes, and the potential to succeed. His experiences form the basis for this story. What ignited your idea for the characters to create a device that would convert raw wasted energy into useable power? I actually wrote the screenplay for the film before writing the novel. This happens occasionally—Godfather and Love Story were both conceived in this order. While working on the film script, the producer and Harold and I were discussing what might work as a basis for the story’s suspense element. We were looking for something that had the means of revealing this ‘unlimited’ potential in people. I don’t actually remember who first came up with the idea of wasted energy, but soon as it was said, we all jumped on it. Simon Orwell, the protagonist in Unlimited, is a brilliant, cynical electrical engineering student who finds danger irresistible. Did you model his character traits after yourself or anyone you know? Alas, we all know a Simon. These days, this type of person is all too common. An individual with huge potential, who allows himself or herself to become distracted by the multitude of temptations that basically define modern life. And yes, I do know several such people. Some turn this into hugely productive directions, thank goodness. Usually to do so requires divine help, a clarification of focus, and strength they must reach out and ask to receive. Armando Vasquez and Harold Finch are important mentors in Simon’s life. Who has been a critical mentor in your life, Davis? How has that person encouraged you to push beyond the boundaries of what you thought possible? There have been several such mentors, for which I remain extremely grateful. One such person is Carol Johnson, who recently retired as editor-in-chief at Bethany House Publishers. Carol has been instrumental in my becoming the best writer I could be, and continues to act as a sounding board for new ideas and characters. Another, I am happy to say, is Harold Finch. His lessons on combining God’s teachings with lifelong aims have been a genuinely rewarding experience with far-reaching results. Many of the characters in the story are orphans. What parallels do you see between the orphans in the story and real-life spiritual orphans? A beautiful question. While researching the core components of this story, orphanage leaders repeatedly stressed the need to teach orphans to believe in themselves and their natural abilities. Too often they see themselves as lost, without purpose, without a role to play, without chances, without love. What made this story work, I think, is how Simon Orwell shares these same feelings about himself. And how he comes to realize God is the only one to fill this need. Many people believe they must wear a mask to hide the parts of themselves they are ashamed of. How is this story about removing that mask? So much of life remains hidden away. The darker elements of a life without God only amplify this falseness. Simon has spent so much of his life, so much of his energy and time, in hiding. As the story unfolds, he discovers that an essential element of arriving at his full potential is being honest with himself. This is where the mask is most damaging, and also where it is often hardest to release. We seek to hide the truth, even when we know the act is a lie in itself. And the mirror we require to see the truth about ourselves is the one that God offers, in infinite patience, in gentle love. The title, Unlimited, has multiple layers of meaning. What does that title mean to you? 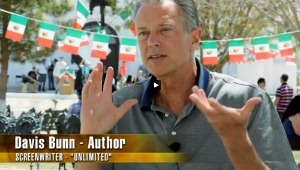 Unlimited was the title brought to me by the film’s producers. When I first began working on this story, it was just that, a title. But as I grew to know Harold, and heard him teach, and read his lesson plan, and then actually applied what he has come to call his ‘Dynamic Life Retreat’ (see Harold full teachings on his website, HaroldFinch.com) I have come to agree with them in their choice. Bringing God into the equation of life’s direction, success, and reaching full potential does reveal the true meaning of Unlimited. Pinterest: http://pinterest.com/davisbunn/ -- check out my “Scenes from Unlimited” board.